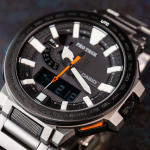 Enter the outdoors world of watches with an affordable yet reliable ProTrek! 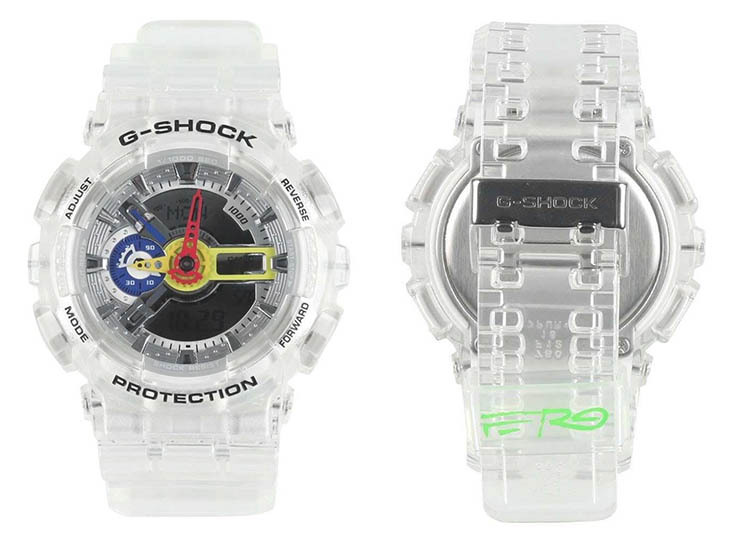 The obvious outdoors choice for a watch! 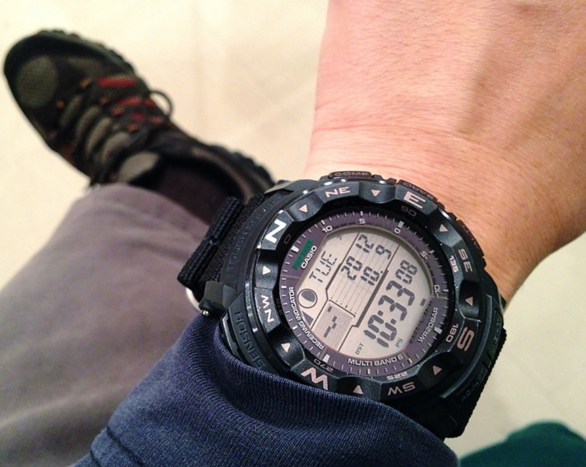 Important note before you begin: The watch that we review is the ProTrek PRW2500-1A. 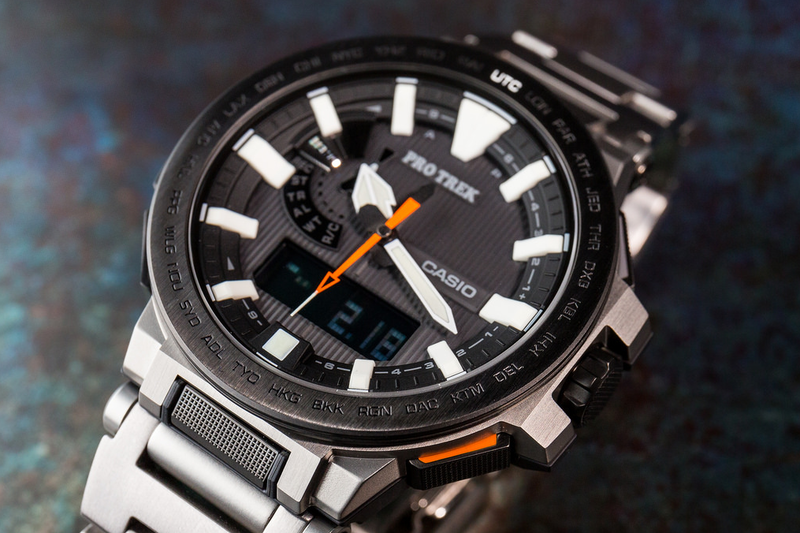 Although there have been a lot of debates whether there are any differences between this model and the PRW-2500-1ER and other variations, we didn’t find any differences between these two besides the color of certain inscriptions on the bezel and the case. If you know anything on this subject please let us know by leaving a comment below. 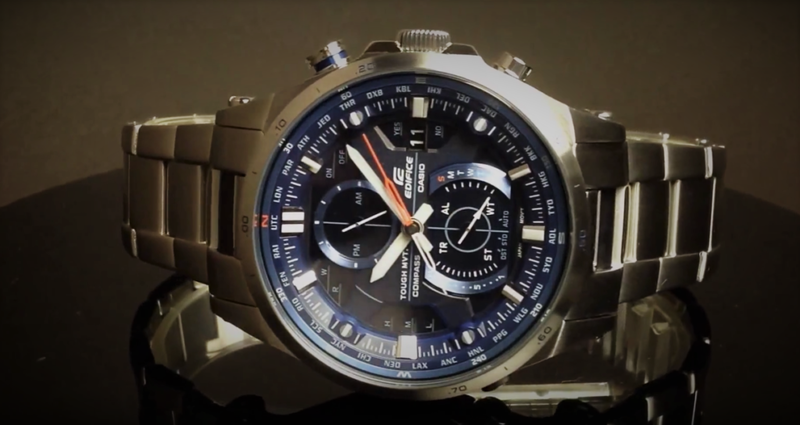 The Casio ProTrek PRW2500 is yet another example of a high quality outdoors watch from Casio with a great sense of the reliability of the features and the overall user’s experience. 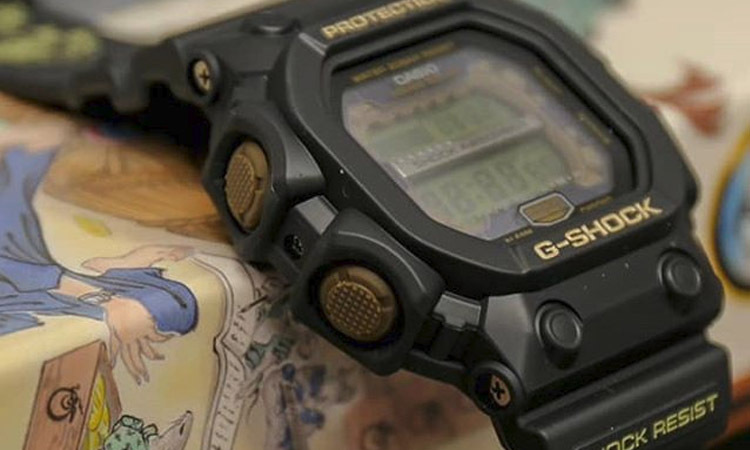 While the materials are not the best quality, because Casio chose to pretty much make a complete resin structure the watch is still great if you take into consideration its affordability. I will begin by covering the design and feel aspects. 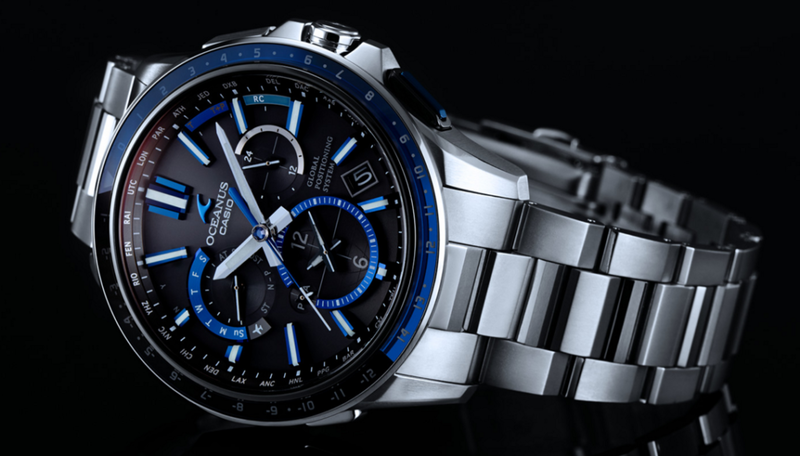 The watch is made predominantly from the quite cheap plastic that Casio uses whenever they want to offer the best price without necessarily regarding the premium feel of the watch. 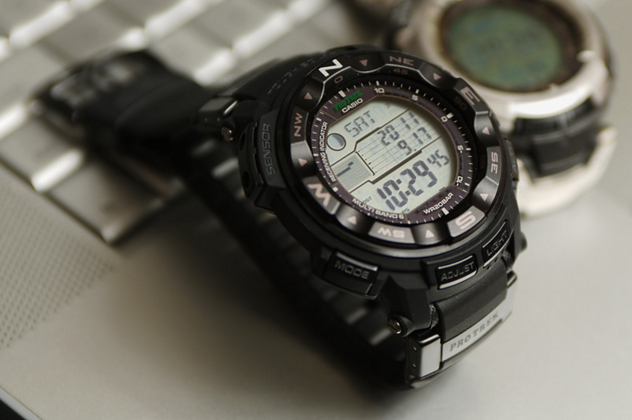 The bezel seems to be made from the same resin but with a different aspect, a glossier one. The window is made from a mineral crystal that is resistant to shocks and scratches. 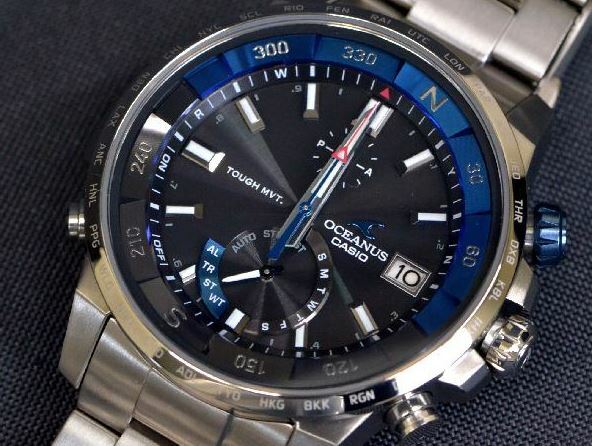 On the wrist, however, the watch is a performer. 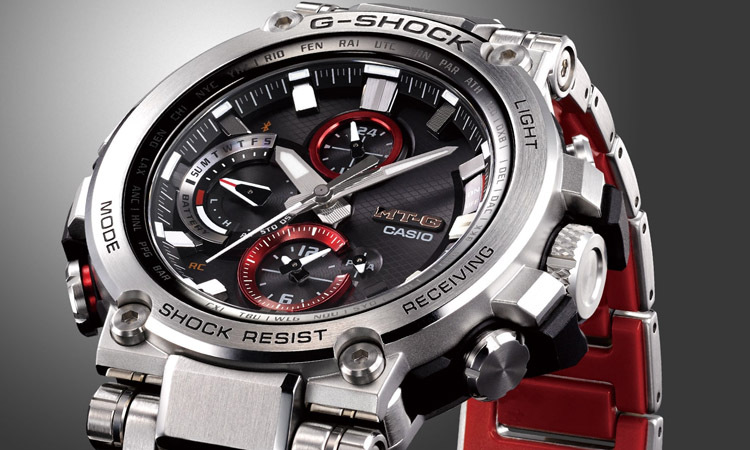 It feels incredibly light and convenient that it will make you want to wear it every time. 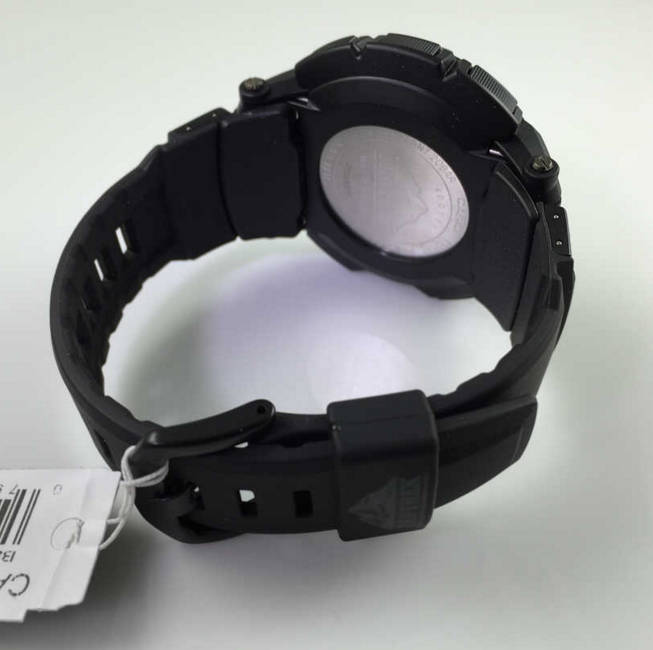 The triple sensor is already famous for encapsulating the most useful sensors for an outdoor enthusiast or why not, a professional. 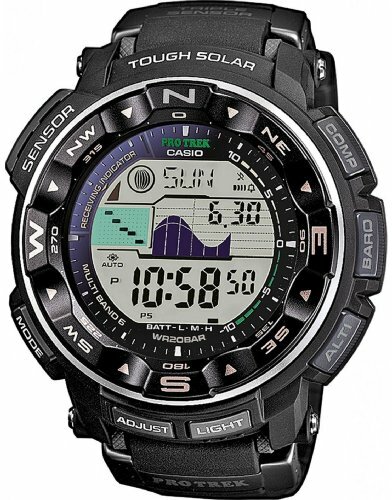 The digital compass will easily guide you through less known environments at the press of a button, the altimeter will make accurate readings of the height based on a reference point and the barometer will make you a weather wizard right away. 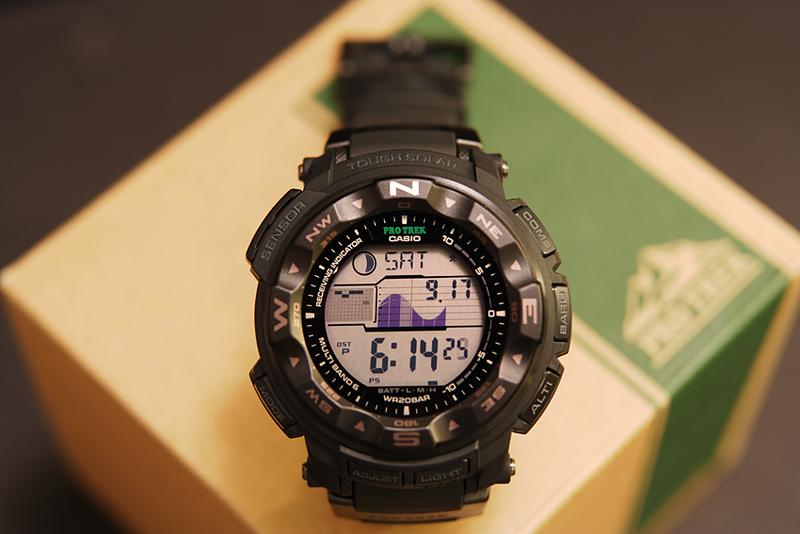 The way it works is by predicting the clime based on the barometric pressure shown on the display. If the pressure is low you can expect cloudy or rainy weather and if it’s high, expect the sun to break through the clouds. That was the deal with the triple sensor but what other features stand out? 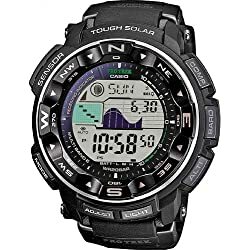 I would start with the tide graph and the moon data features which are useful for those who constantly work or have fun in the oceans or the seas where tides are a common thing. With these two features, you will be capable of planning in advance your activities. Another nice feature is the sunrise and sunset data. 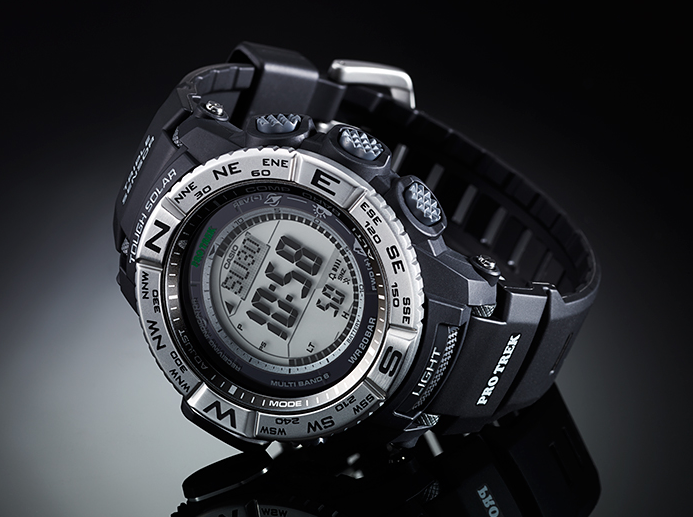 Besides these, we have the world time feature, the thermometer, and the solar charging. 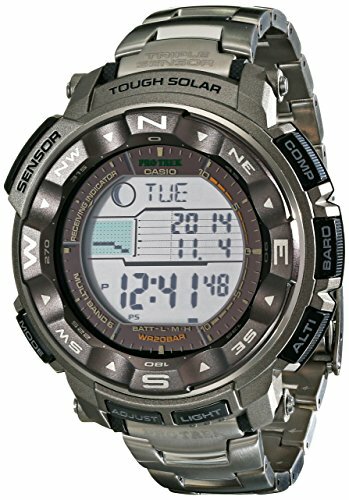 The rest of the features like the alarms or calendar are not worth the talk because these can be found on basically every Casio watch. 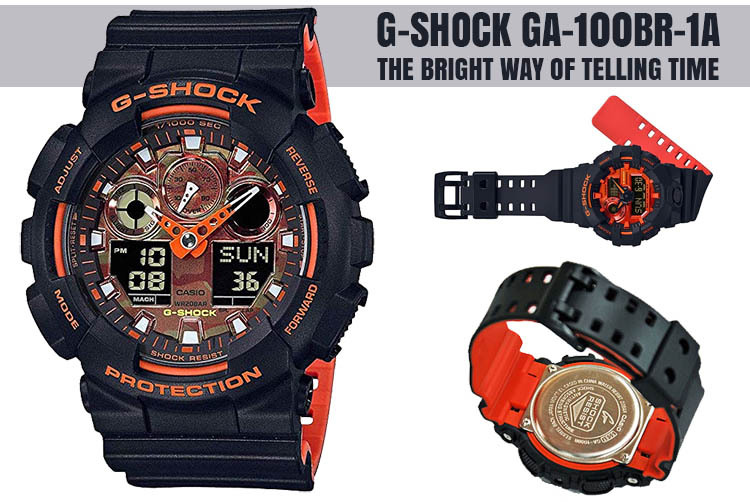 You might wonder how can the display of this watch show different colors? 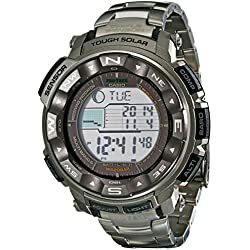 Well, this is achieved by the so-called duplex LCD display designed by Casio that uses two layers colored differently which are placed on top of one another. 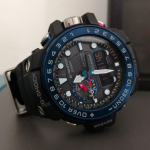 This is a nice feature to have on a fully digital watch like the ProTrek PRW 2500 especially because you can better read everything at a glance. 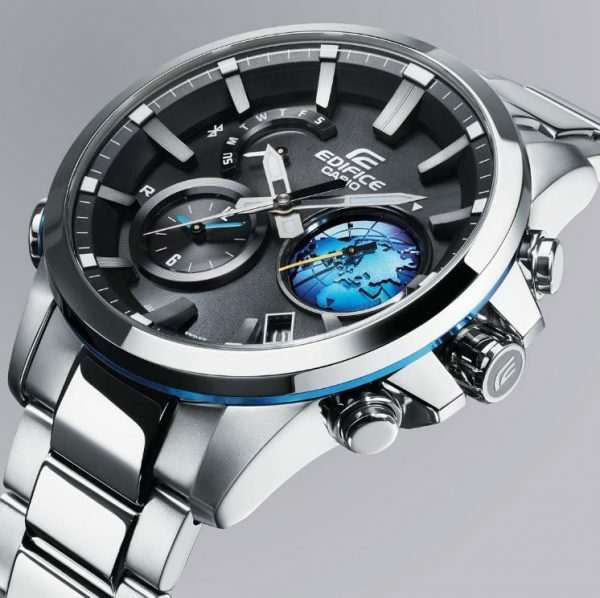 As you can see in the image below the watch is not made of premium materials. 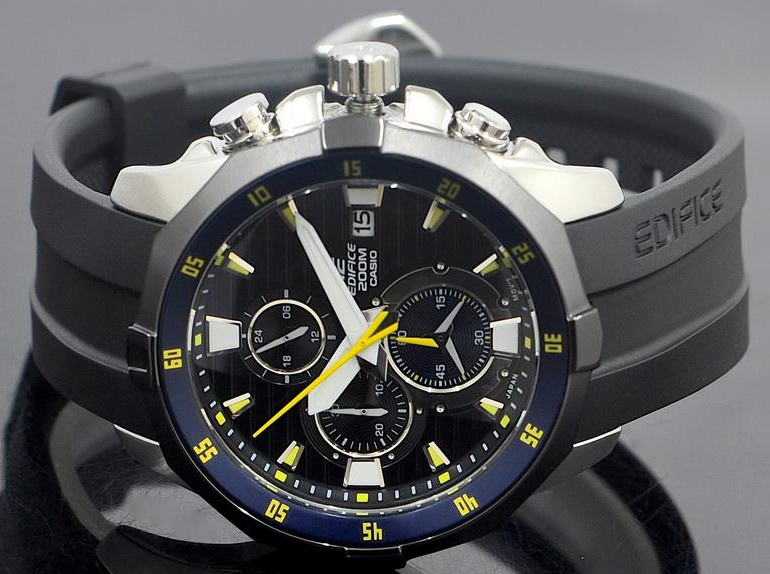 That is to be expected since the watch was created with affordability in mind. 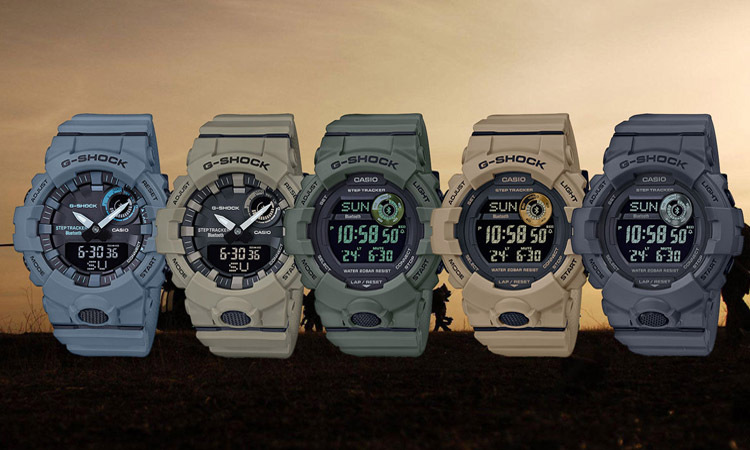 You can’t have them all at the price especially when speaking of the features, Casio pretty much included most of the ProTrek’s line goodies along with some Gulfmaster treats (moon and tide graphs). 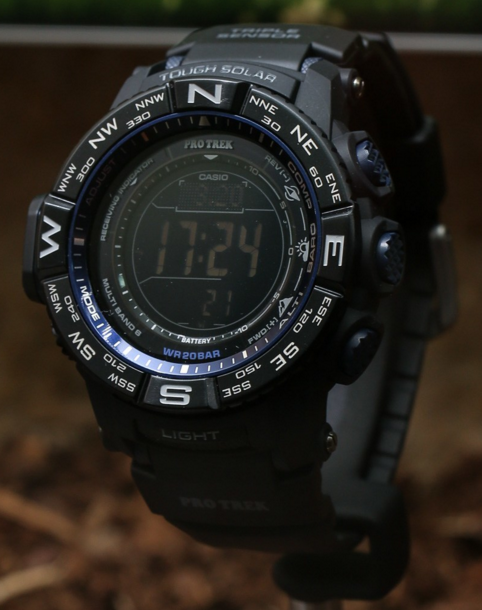 Finally, the obvious question arises: Is the ProTrek PRW2500 worth it? I would say, definitely. 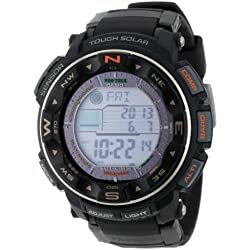 Every outdoors person who had a ProTrek or at least, a G-Shock before knows the time and work a watch of this type saves. 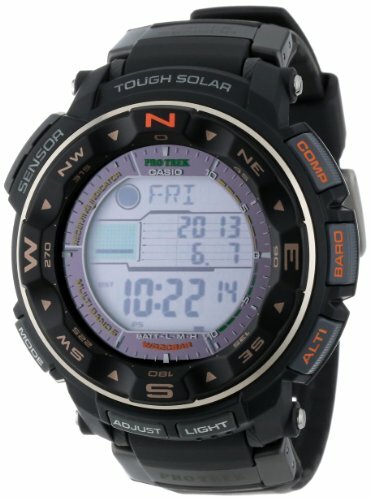 The features of a ProTrek are at least useful if not revolutionary, and can make your outdoors life so much easier. Give it a try, you might like it! 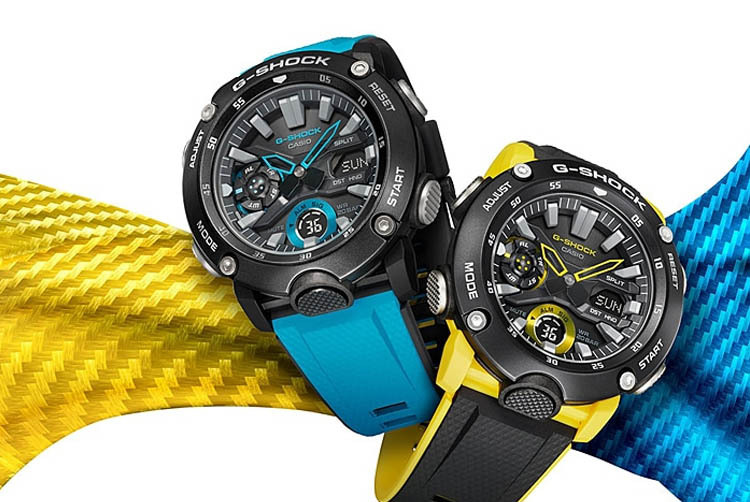 Check out our homepage for the best outdoor watches or the best ABC watches.